BHIRINGI SAMSAN KALI TEMPLE WAS FOUNDED IN 1852 AD (1259 of Bengali year). It was founded by Siddha Trantrik Gurudev - Sri Sri Akshay Kumar Roy of Bhiringi, Durgapur- 13, Dist - Bardhaman.In this Great Endeavour Naga Baba Tulsidas Gosain Maharaj of Buxur, Bihar was with him. 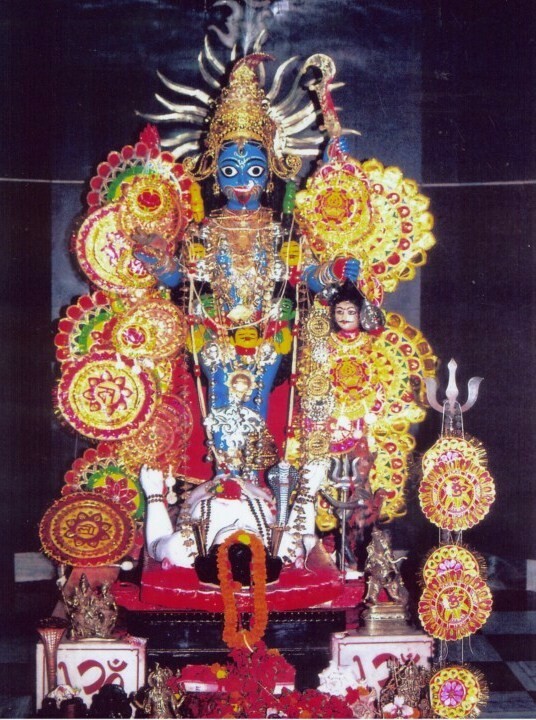 In pursuance of Naga Baba's desire in the Bengali year 1259 the idol of goddess KALI MATA was installed on PanchMundi seat(The seat consisting of five heads). This Temple stands on the Burning Ghat of Bhiringi Village. 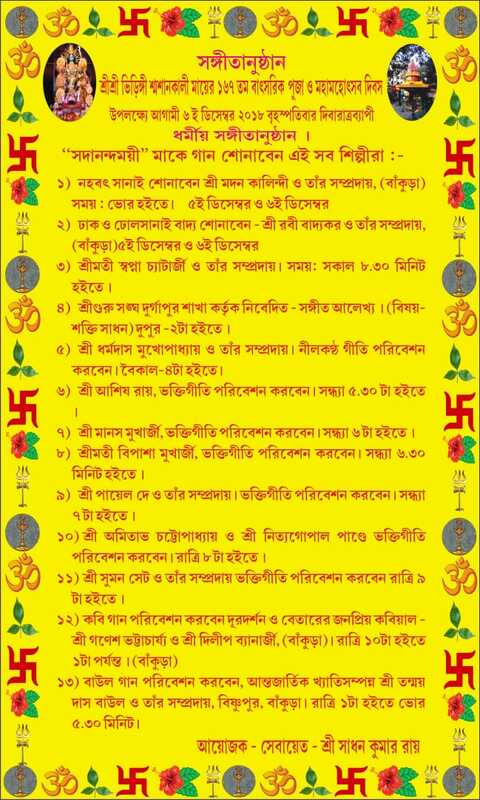 The yearly Puja and Mahotsav of KALI MATA is organized on Amabasya in the dead of night in the month Agharayana (December, after Dipawali).The Temple is located in a plot of land measuring 4 Bighas. “Siddhatantrik ” Sri Sri Akshya Kumar Roy , "Tantrikacharya" Sri Sri Jagdish Chandra Roy, Sri Sri Abanikanta Roy,"Gurudev" Sri Sri Rabindranath Roy devoted themselvs for this temple throughout their lifetime. Sri Sadhan Kumar Roy is the Present Sebayet of this temple. In the left the picture of Kali Mata with this temple is shown. On every "Amabasya" at night more then 500 disciples take "Prasad" after "Puja" and "Hom". On the occasion of the Yearly Puja Day - Puja Path , Hom Yagnya are performed and more then 30,000 disciples take the Prasad of Kali Mata. Over a Lac of People assemble on this Puja Day. On the day of "ASTAMANGLA"(The 8th day since the Puja) about 20,000 religious minded people throughout India &Abroad take "Bhog Prasad". 1. The Temple of Goddess KALI MATA. 2. MAHAKAL BHAIRAB (Samshan Bhairab). 3. The Temple of TRIGUNESHWAR MAHADEV. 4. The Temple of Sankat Mochon (SRI SRI HANUMANJI). 5. Naga Baba's SIDDHASAN and PANCHA SHOOL. 6. Samadhi Mandir (Creamation Ground) of Naga Baba and forefathers. 7. NAT MANDIR (The Place for Song and Path Probachan). 8. SRI SRI GANESH MANDIR. 9. RELIGIOUS PLATFORM (The stage on which Mahamandaleswer and Maharaj's given Religious Speech and Teaching). 10. FREE RELIGIOUS LIBRARY AND READING ROOM. 11. Good arrangement for DRINKING WATER to the common people. 12. AMBULENCE SERVICE (Day and Night) available. No subscription of any kind is ever solicited on behalf of the temple. There is no "Devottar"(in the name of Deity) property. All expenses for Bhog Prasad, Puja-Path, Hom-Yagna of KALIMATA , Charitable and Social expences and wages of the priests, electric charges, telephone charges and all other allied payments for maintenance and repair of the temple premises along with the family maintenance cost of Sebayet Sri Sadhan Kumar Roy are met out of voluntary contributions and donations by the devotees of the Goddess KALI MATA. The disciples and devotees are spread not only Bhiringi-Benachity-Durgapur but also the whole of India and abroad. 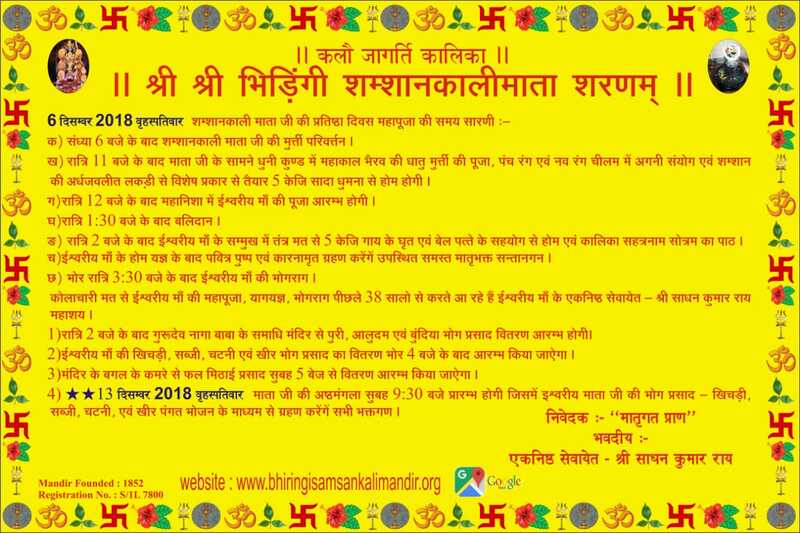 The whole chain of Sebayet of Bhiringi Samshan KALI MATA belong to the Bandyopadhyay Bramhin Priest of Sandilya Gotra(sect). The Philosophy of our Organisation lies on mission of our mythology 'Seva Param dharama' meaning - nourishment is the greatest of all religions.We sincerely believe in the principle of 'Jatra Jeev Tatra shiva'-Swami Vivekananda. Voluntary donations and contributions of any amount will be taken greatfully. 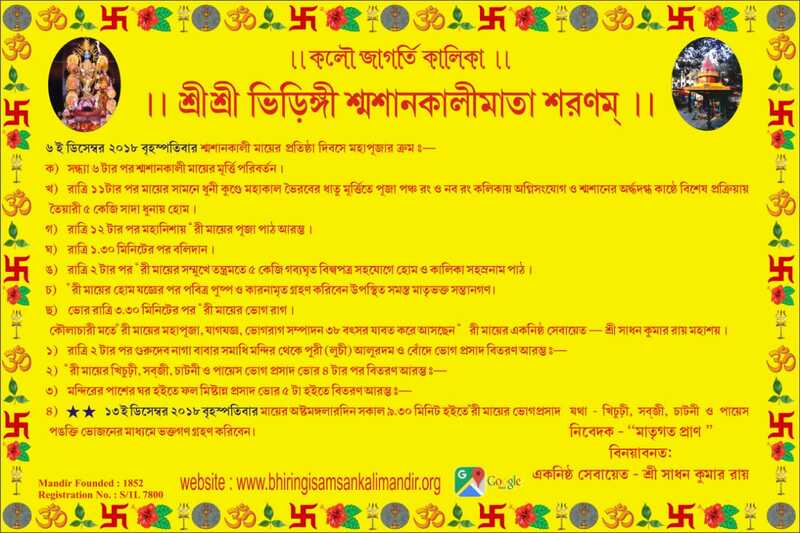 Donation may be made in favour of “SRI SRI BHIRINGI SAMSAN KALI DEVI MATA SEVA SAMITY”. 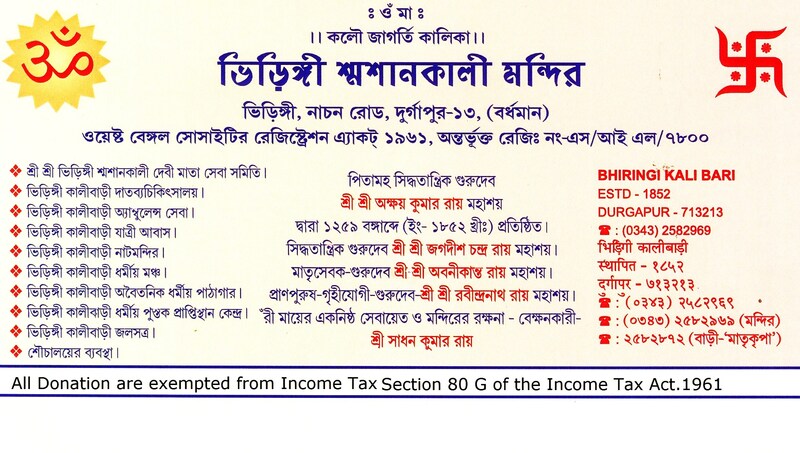 Donations are exempted from Income Tax under sections 80 G of the Indian Income Tax Act 1961.The reciept of the donation will be sent accordingly.